Think Spring: How many bee hive boxes do I need? Should I get a bee hive kit? My beekeeping kit :D. I am trying to get a handle on how many boxes I am going to need come spring. Today, the high is only 26F. Old man winter is here. This is the time old and new beekeepers alike get all their equipment ready for our busiest time - spring. If you've taken your bees through at least one main flow, you know what to expect. 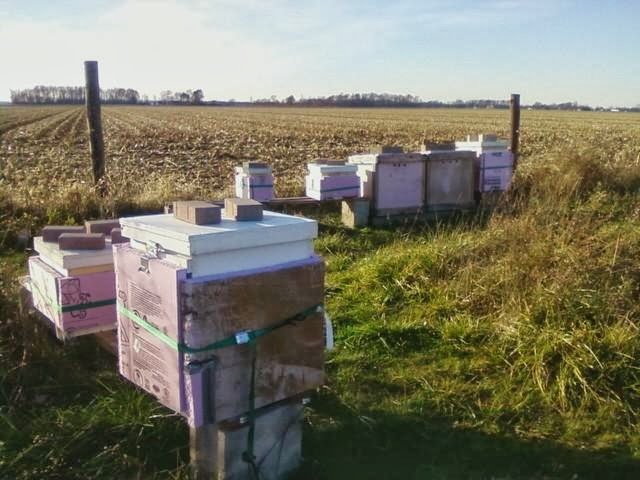 However, if you started your bees late or if your package or nuc suffered a major setback, you are pretty much in the dark about what to expect. The average honey crop for Ohio is reported as 66 lbs. per colony. This ends up being a little bit more than a full deep super, so adding a spare should get you to my number of 3 deep supers per colony. Additionally, you need to take into effect swarming. There are various techniques to reduce swarming, but to be on the safe side, I would like to have an additional complete hive set (bottom board, brood boxes, inner cover and migratory cover) for each hive going into honey production. This winter, I am trying to overwinter 19 colonies, 5 in a standard double deep setup, 5 in a single deep and 9 in 4 frame nucs. According to the Bee Informed survey, the average colony loss for last winter (2012/2013) was 45.1%. If the same scenario plays out for me this winter, I would have about 10 colonies to put into honey production this spring. So, let's put all of the above into numbers. To get 10 colonies into production, I will need 5 deep boxes each (2 hive boxes for the broodnest and 3 for honey supers). In total, I am going to need 50 deep boxes to house my surviving colonies. I have 15 deep boxes currently occupied by bees and 26 spare boxes (out of which only 16 have drawn comb or foundation) for a total of 41 deep boxes. I will need to build 9 more boxes to accomodate the bees and the honey production. I will also need 10 more hive sets (or additional 20 deep boxes) in order not to lose bees to swarming. I will also need to assemble and wire 390 deep frames and foundation. Of course, all of those numbers assume only half of my honey bee colonies make it through and make no allowance for rapid expansion. I may end up needing as many as 45 extra boxes. Do you plan to grow next year? How many boxes do you think you're going to need? The home apiary before the storm. The home apiary after the storm. 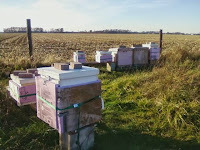 I wrapped my hives in the begining of November, and this past Sunday the hives (and wrapping) passed their first test. The Toledo Blade and the National Weather Service report that the strong storms that hit our area on the evening of November 17, 2013 have resulted in 3 confirmed tornadoes that struck parts of Perrysburg and Lake townships, Northwood, and Oregon. Wind gusts reached up to 125 mph. The next morning, we went to check on our hives - as you can see from the before and after pictures above everything was fine. The wrapping withstood its first test. The hive closest to the front in the after photo came close to being blown off the stand, so we will have to work on anchoring it this weekend. Maria's Bees YouTube channel is officially opened! My first two videos are a family effort :D ! The first one shows you how I make the frames. You can find it here. The second one shows you how to pour the fondant. You can find it here. You can find my printable recipe here. Honey bee candy boards in the making. The facility is under tight security. I make my own boxes (deep) from 1 x 12 pine boards. I use half-blind dovetail joints. The rims that you see on the pictures are the extras left over once I cut the box down to proper depth. They are 1 3/4" deep. I actually like having them since they make tight-fitting inner covers (crown boards) and bottom boards. Today, they are going to make tight-fitting bee candy boards or bee fondant boards. I cut a 1/4" thick plywood to act as the lid on my fondant board. The kids helped me decorate them with bee pictures :D. I used 3/4" narrow crown staples to fasten the lids to the rims. Finally, I routed a 3/8 x 1/2" upper entrance in the fondant board. The bee candy boards are ready to be filled with fondant. Now it is time to make the bee candy board | bee fondant boards. I've made a printable copy of my bee candy board | bee fondant recipe here. You can see the video here. This sets very quickly! Make sure you have your power stirrer, your spoon | spatula, your forms, the pollen, your gloves and the extra sugar set out. Put the gloves on and carefully take the pot next to your forms. Make sure you have your spoon | spatula, your mixer and the pollen | pollen substitute ready. Dump the extra sugar into the mixture, mix it thoroughly and spread it into the forms. Add the pollen | pollen substitute and tap it in. The final product: bee candy boards | fondant boards ready to be put on the hives. Those took 90 lbs. of sugar. I want to say a few final words on using bee candy | bee fondant boards. The boards that I just made weight roughly 7.5 lbs. for a nuc-sized board and 15 lbs. for a standard-sized board. Adding a candy board on a nuc will increase the honey bee colony's resources by 54%. Adding a candy board on a colony in a single deep will increase its resources by 27% (a bit more than 1/4). Adding a candy board on a colony in a double deep will increase its resources by 21% (a bit more than 1/5). Adding a bee candy board cannot make up for failing to feed a light colony earlier in the fall. It can, however, add extra insurance for smaller colonies going into winter. One final note on the timing of installing a bee candy board. The bee candy board recipe includes pollen and pollen stimulates brood rearing. As a result, you do not want to add this candy board before the colony starts clustering consistently. Otherwise, your colony may end up trying to cover too much brood once the weather gets cold and result in a split cluster. You want the candy board to be a last resort of sorts and you really want the bees to find it and start using it in late winter, when they start rearing the brood for the new season. I spent this weekend wrapping my hives. Couple years ago, I made two home-made hive cozies. They slip right over the hive on the stand. You can also remove the "roof" and get into the hive without having to pull the entire "cozy" off. They are perfect if you only have a couple of hives. However, they are way too bulky to store in the summer. You can see them on the "after" picture. The duct tape goes completely around and ends up on itself, since sometimes when it is cold (as it was yesterday) it does not stick on the foam. For a strap, I used a 1" x 6' cam buckle strap. I prefer those instead of ratchet straps as they don't seize after being exposed to the cold and rain all winter. Of course, of you have more hives, either one of those straps may not be practical. A simple spool of 1" webbing and a trucker's knot will accomplish the same at a fraction of the cost. So, what is the purpose of wrapping hives? After all, bees have made it without wrapping for millions of years. I wrap because it stabilizes the brood nest temperature and reduces condensation. If you ever had a strong hive and not-so-strong hive side by side, you probably noticed that the stronger colony starts to forage earlier and finishes foraging later than the weaker colony. This is because the stronger colony has more foragers to spare. Adding insulation to a colony also allows it to send out more bees as foragers. It reduces the temperature swings between the daytime high and the nighttime low. With insulation, a honey bee colony needs less nurse bees to maintain the brood nest temperature. In this way, an insulated honey bee colony can resume brood rearing earlier in the spring than a non-insulated one. It can also make the most of the first pollen flows (maple and willow here in NW Ohio) that usually happen during marginal flight weather. An insulated colony will usually be 2 weeks ahead as far as population and brood rearing are concerned compared to a non-insulated colony. An added benefit of insulating your colonies is that the insulation dramatically reduces condensation on the roof and sides of the honey bee hive. As you probably know, moisture in the winter kills bees. Sometimes, moisture in the hive is introduced by uncured syrup, especially if you had to feed late in the fall and the bees did not have time to cure and cap the syrup. Moisture is also introduced through the metabolic processes of the cluster itself and the conversion of honey into heat by the honey bees. If the top of the hive is not insulated, the warm and moist bee breath forms condensation droplets right above the cluster. The resulting water droplets can drip on the clustered bees and quickly chill and kill them. Adding insulation overhead as well as gently tilting the hive towards the entrance alleviates that. Of course, once the bee hive gets cozier due to the added insulation, a slew of other critters want to make it their home, too. The most destructive are the field mice. You probably haven't seen any traces of mice in your apiary. Mice are tricky. They usually invade the hives once the bees start clustering consistently. Then they can make their nests at leisure, often destroying the entire bottom box by chewing through the frames and foundation. If the weather warms up unexpectedly for the mouse, the bees will kill it and completely propolise the body. I always recommend putting mouse guards on. They are quick and easy to install and can save the beekeeper a lot of grief in the spring. You can make them from 1/4" pet fencing. This year, I used drywall corner (available in all home improvement type stores) that I cut to size and drilled 3/8" access holes. If you use a wood block while you are drilling, your holes will be clean and won't have burrs and sharp edges that can damage the honey bees wings. This blog post is getting quite long. I will finish it next week with pictures and recipe for my candy board. I will also talk about upper entrances for winter. Meanwhile you can tell me in the comments how you insulate your hives. Did you insulate already and if not when do you plan to do it?